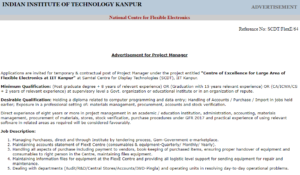 IIT Kanpur Project Manager Recruitment 2018-2019, Last Date 26 October – In association with National Centre for Flexible Electronics, Indian Institute of Technology Kanpur has released the official job vacancy recruitment notification PDF online under Reference No: SCDT/FlexE/64. Online Application Form filling procedure is being continued now for Contractual and Temporary Posts of Project Manager. Name of the project is “Centre of Excellence for Large Area of Flexible Electronics at IIT Kanpur” at Samtel Centre for Display Technologies (SCDT), IIT Kanpur. After this job vacancy recruitment, under administrative staff section of the official website on www.iitk.ac.in/dord/administrative-staff, Board of Controller of recruitment and examinations, Indian Institute of Technology Kanpur has released the Job Vacancy recruitment on 17th October 2018 for Deputy Project Manager and 24th October for Assistant Project Manager. Of all the selected candidates, Salary Range would lie between – Rs. 24000-2000- 60000 /- per month based on qualification. For any further queries related to this recruitment drive, candidates can contact Indian Institute of Technology officials right away on the contact details given below – Siddhartha Panda Coordinator, Room No. 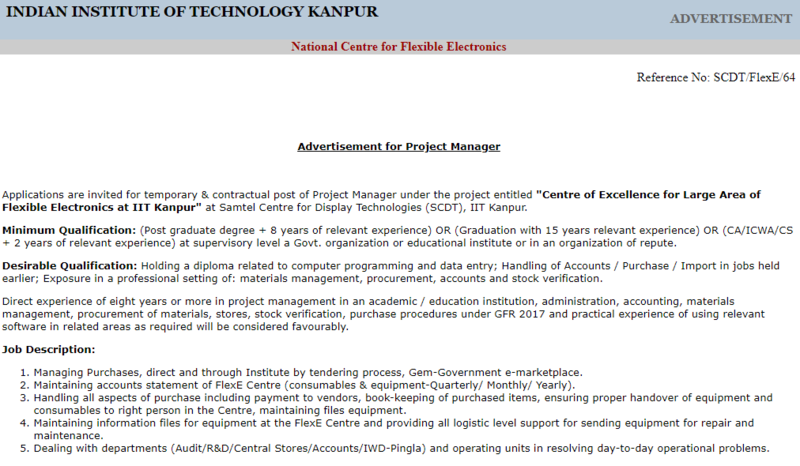 : 305, Samtel Centre for Display Technologies Indian Institute of Technology Kanpur Kanpur – 208016 (India). Apart from that, Board has already finalised not to give any travelling allowance or dearness allowance to the candidates.